I’m not sure it’s an improvement on “Beam me up, Scotty.” After all, we’re talking about riding the business end of a lightning bolt here. Still, you can’t quibble with the real estate covered. The bifrost bridge/teleportation device in Paramount’s clamorous new “Thor” allows the Nordic hunk of the title to genre-jump: He starts out in the mythic realm of Asgard and, after being betrayed by his brother and banished by the old man, is sent hurtling to ‒ where else? ‒ New Mexico, a.k.a. UFO Central. The last super hero to do this with aplomb was the Man of Steel himself. Which may explain why Thor (Chris Hemsworth) in midflight, red cape flowing, brings to mind Superman as played by Christopher Reeve. Subbing for Marlon Brando’s Jor-El? A bearded Anthony Hopkins as Thor’s father, Odin. “Do you swear to guard the nine realms ‒ cast aside all selfish ambitions,” Odin asks his arrogant first born in what we immediately peg as a coronation deal-breaker. Once on this Superman kick, director Kenneth Branagh ‒ yeah, that Kenneth Branagh ‒ never lets up. He even includes a variation on the Lois Lane-Superman courtship flight. 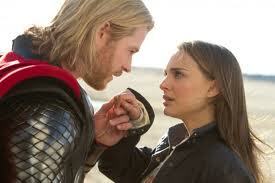 Only this time it’s an astrophysicist named Jane Foster (Natalie Portman) who’s swept off her feet, but, darn it, we don’t go along for the ride. And when Thor’s favorite weapon comes crashing down behind him, it’s not much of a stretch from “The Sword in the Stone” to the hammer in the stone. Where Branagh excels is in the romantic comedy department. It was a stroke of luck to get Oscar-winner Portman for his heroine/love interest. Portman, ably supported by Stellan Skarsgard and Kat Dennings as research assistants, brings just the right light touch to her incredulous but game scientist. You can sense that she’s having a good time and glad the masochistic rigors of “Black Swan” are well behind her. This certainly shows in her rapport with Hemsworth, who has his best moments dealing with local vendors in Viking-speak. “I need a horse!” he tells a flummoxed pet-shop owner. I thought the film good fun the story was decent and you sound like a person that needs to watch those boring movies nobody watches or cares about that wins Oscars! I know it’s no Oscar winner perhaps like Lord Of The Rings and far as the set looking like a cartoon … Ummm hello it’s a comic book! I thought the set work looked like it should for the type of movie it is! This is a movie where the parts are greater than its sum. Hemsworth made for a good Thor, I really liked the humor, I liked Mjolnir as a plot device. The movie as a whole just didn’t mesh for me. With every other movie heavily reliant on CGI, Thor’s visuals just didn’t impress me. When the Asgard scenes weren’t murky, they were too busy. Definitely two stars. I wasn’t aware Branagh helmed this project. Interesting departure. A long way from Shakespeare…a long way from “Dead Again”. What a disappointment! Thor is a bore. I don’t agree with this review at all. It seems you’ve already gone into this movie with a biased opinion on the whole super hero genre. It seems that you already had this whole movie criticized prior to watching it. I say this because it seems like theres no point in watching a movie you knew you were going to hate off the bat. My gripe with this movie was that I wished Branagh worked on Thor and Jane’s relationship more because Jane is Thor’s anchor to our planet. They could’ve also stretched the running time out a bit more just so they could build a little more on Thor learning humility.